Mims United Methodist Church welcomes you in Christian love. We invite you to come and be a part of our vibrant, friendly, growing community of faith. 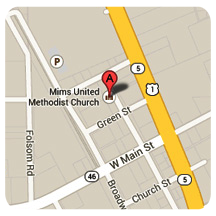 Whether you're new to the Mims area or have been here all your life, we want you to know that Mims United Methodist Church is a place where you and your family can find a church home in Christian love. "Caring for Others Through Christ" recognizing the diversity we have within this congregation of God's people who are seeking a rich bond of relationships centered on the presence of Christ and involving each of us in a serving ministry to others. 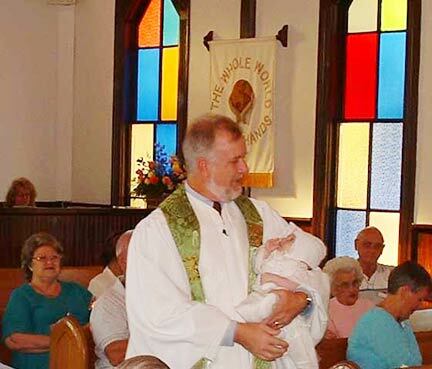 The Mims United Methodist Church and the First Baptist Church of Mims are hosting the 10th annual Mims Mullet Festival on Saturday, October 1st, from 10 a.m. to 5 p.m.
John's first Baptism presenting to the congregation.